Every Porchlight Home is built with genuine care and personal touch, but our homes don’t reach their full potential until a family moves in. That’s because every family adds their personal design touch. Styling and designing the interior of your home is a fun form of creative expression. Decorating an entire home on your own can seem overwhelming. We’re here to give you some simple design tips so you can decorate a new build home like an interior designer. At Porchlight Homes, your new build home is like a blank slate. This is an interior designer’s dream. No need to strip out old paint colors or flooring. Your home already has a light and bright neutral color palette to work with. 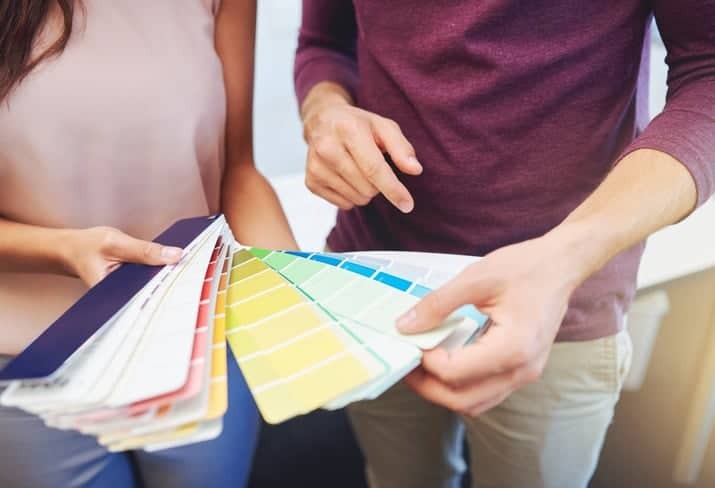 If you want to add a personal touch with paint, most interior designers will advise you to stick with the neutral palette. Trust us, neutral doesn’t have to equal boring. You can still be bold with a neutral color. An earthy green tone or dark navy blue are great choices for a boy’s bedroom, for example. Another secret that interior designer’s use to create an inspiring space is choosing beautiful lighting fixtures. The size of the lighting fixture adds balance to a room, while its style provides ambiance. If you want to make a statement, an easy way to do so is by installing a beautiful chandelier in an entryway or above a dining table. With a new build home, it’s easy to forget about bedroom lighting. While most interior designers don’t love the look of ceiling fans, in Arizona the design rules are a little different when it’s 110 degrees outside. A ceiling fan with a built-in light is a great way to add lighting and comfort to a bedroom. Once you have the walls painted, you can start adding your furniture. The secret to decorating your home like an interior designer is to first decide on your personal style. That way you can use that defined style to help you find pieces that pair together and create a cohesive look. When you’re starting to decorate your home, we suggest you start by only buying furniture that you need. If you only have a bed and one dresser in a bedroom, that’s okay. Don’t feel like you have to keep adding things. That way you can take your time finding accent pieces that you truly love, rather than feeling like you have to buy something. The simplifying rule goes for decorating your walls, too. A gallery wall is a popular choice for many families. Doing a statement wall is an interior design trick because rather than adding something to every wall, you only have to focus on one wall. Plus, a gallery wall is a special way to showcase all your family memories. The best tip we have for decorating your home like a model home is to look for designs you love ahead of time. Find inspiration from magazines or by touring model homes. Then, use those as inspiration for your own home. Whether it’s replicating a well-done gallery wall, or arranging your dining room in a unique way, there’s no harm in copying a design that you see in-person or online.